Flames will have quite a busy schedule as they go on a Pacific Division road trip. First up is Anaheim tonight, then Los Angeles tomorrow, and Phoenix on Saturday. That is three games in four nights. The bad news: They just lost to the Ducks on Saturday. Also, the Flames road record this season has not been "elite". Furthermore, their record at the Ponda Center is horrible. 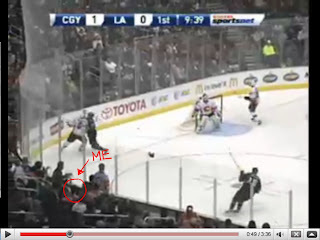 The good news: I will be at the game tomorrow at Staples Center. AWESOME!!! If you are watching on TV or will be at the game, look for me. I will be wearing a 2006-07 Phaneuf jersey, red of course. I am sure there will be plenty of "Puddles of Red" at these away games.